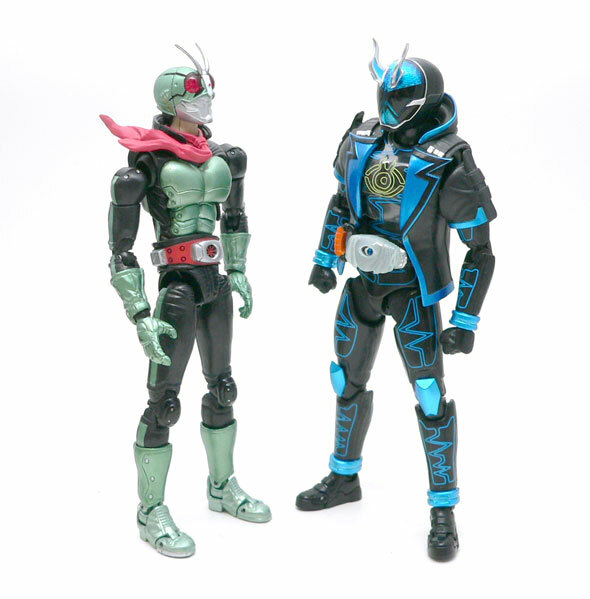 I realized recently that while I’ve obtained a bunch of SH Figuarts Kamen Rider figures, I’ve never reviewed any of them on the site. I figured the older stuff could wait, so I would check out a newer release. 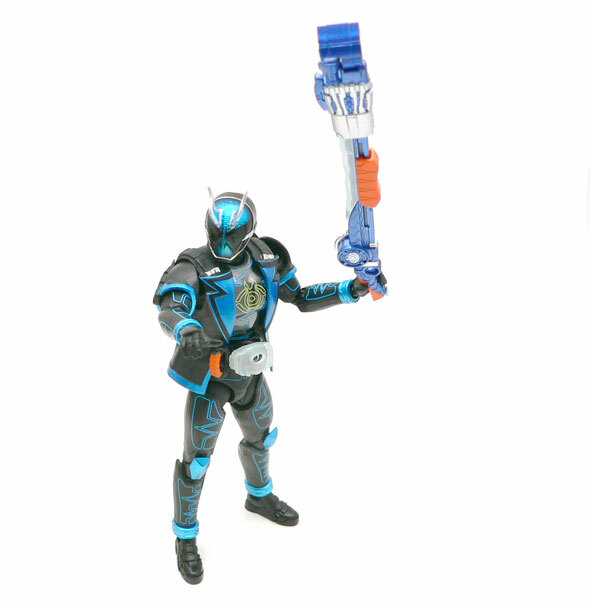 I recently got both of the main Riders from Kamen Rider Ghost, so today I’m looking at the newest, Kamen Rider Specter. 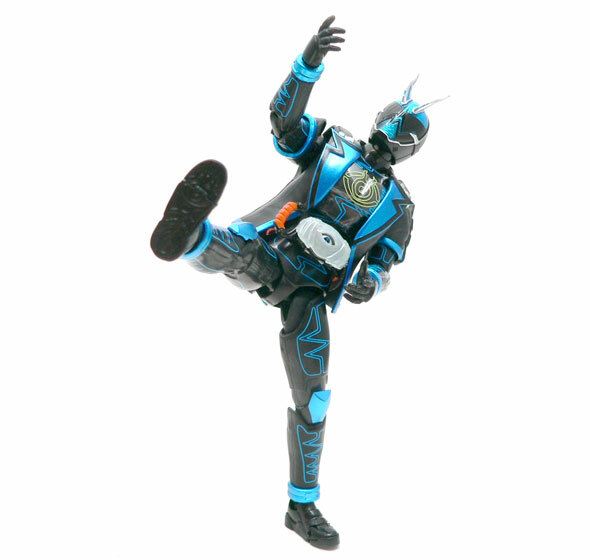 Specter is the Rider version of Makoto Fukami. Makoto and his sister spent a significant amount of time in the Ganma (Spirit) world. They survived the experience, but were definitely changed. Early in the series Specter is adversarial to Ghost. He’s as driven as Takeru to find and collect the Eyecons….but for what purpose? Okay. You might be completely lost. I wasn’t the biggest fan early on of Specter. I almost passed on pre-ordering him. I didn’t because his design is intriguing. The double horned face head gives him a very traditional Japanese Oni look. At least to me. The dark blue is a distinct contrast to Ghost’s orange trim. If you aren’t familiar with SH Figuarts, they are the Japanese equivalent of Marvel Legends sort of. They are a higher end collectible type figure. Normally, they come packed with multiple hands and accessories. On top of that, they are fairly well articulated while maintaining character detail. Most standard releases are in the 30-40 dollar range. However, this varies a lot with where you get them and if they are a special release or not. From what I can tell, Specter and Ghost share most their parts except for the head. The main difference being Specter’s electric blue Tron lines. The paint surprised me, it’s got a bit metal fleck in it to give it a bit of sparkle. I didn’t realize that that until I got him into some decent lighting. It does add just a little extra glow. Speaking of the head, Bandai did something here I’m not so sure about. Most of the time from a distance, his face plate looks solid blue with the black eye designs painted on to it. 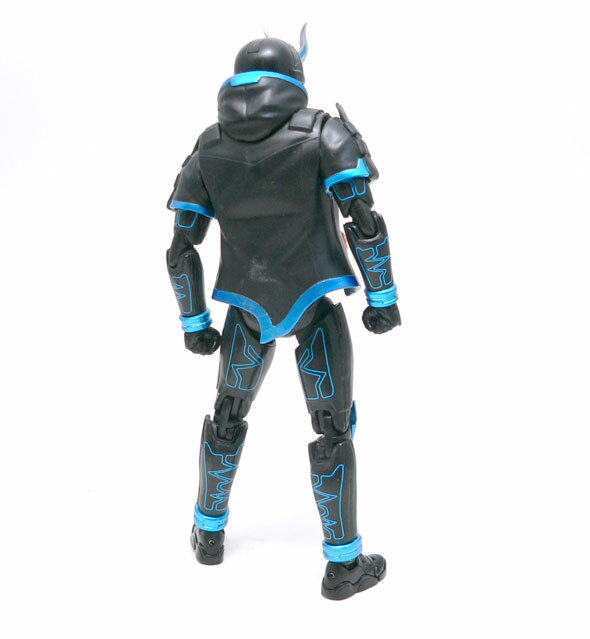 Here they used a common Kamen Rider Figuart technique of adding texture to the inward facing part of the clear areas. 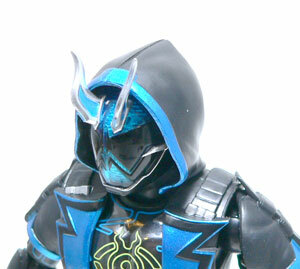 This normally gives Kamen Rider figures multifaceted looking bug style eyes. Here though because it is inverted, it’s almost too much texture. I notice on some close up screen caps, there is a pattern under there, but it’s smaller and less noticeable than it is on this figure. It’s not a huge deal, and most folks will never notice. 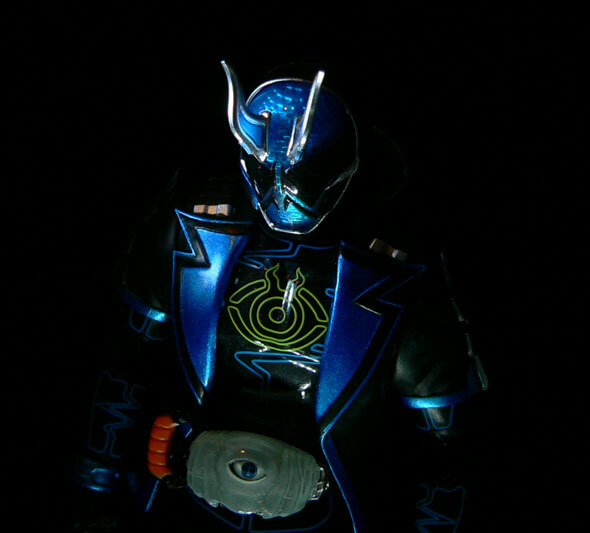 When characters transform (“Henshin”) on Kamen Rider Ghost, they typically come out of the metamorphosis with their hood up on the jacket. The jackets very by which eyecon is used and fly around the character briefly in the process. To replicate that, there are two version of the hood. On is up, the other is down. 98% of the time the hood is down in this form, so it makes sense that is how he is package. Each of the hood’s plugs in differently. The down version pegs into the bottom of his neck on the jacket. The up hood is a little trickier. To keep the hood with his head as it moves, it pegs into the top of his head. Now, that would look hideous when his hood is down. 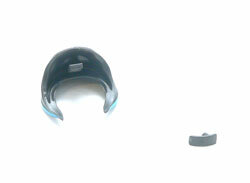 To fix that, there is a very tiny piece that plugs and unplugs from the top of his helmet. In the instructions it tells you take care not to misplace it. Now, this wouldn’t be a Figuarts figure without a bunch of hands. He comes with punchy hands in place when you get him. There are another 3 sets in the box with him. Each is a variation of open or gripping hands. I haven’t figured them all out yet. (I didn’t have my glasses on.) They pop on and off of tiny ball and sockets. I struggled changing the left one. Either due to the wrist moving, my dexterity or both. I also learned when doing this the instructions are correct. His horn points are sharp. 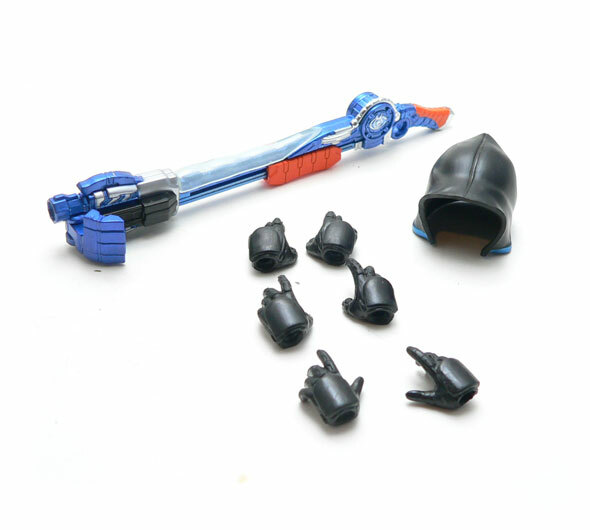 Specter also comes with his trademark weapon, the Gan Gun Hand. It’s a combination staff and rifle of sorts. The piece is really well detailed. This is something I think sets SH Figuarts apart from the American lines. They don’t skimp on the accessories. There is a milky clear piece mounted to the the top of the weapon. In addition. the “hand” portion at the end of the staff can be moved to different positions. The orange slice handle can as well. Yeah, I have the slide in the wrong position for where the hand part is. I’m sorry. I couldn’t remember when I was taking pictures which way it went. The care and detail in this accessory is as much as any portion of the figure itself. I don’t normally talk about packaging, but this figure, and Ghost for that matter, come in newer smaller boxes than the previous Riders I’ve picked up. The down side to this is, while it is still a window box with collector friendly trays, you can see a lot less of the actual figure. I kind of wish they had kept the larger boxes for consistency, but I don’t plan to display in box. Your personal mileage may vary. The other packaging this was small bits of plastic. I assume to keep his jacket from sticking, there are small pieces of vinyl or thing stretchy plastic in multiple places on this guy. The one under his belt is particularly hard to dislodge. 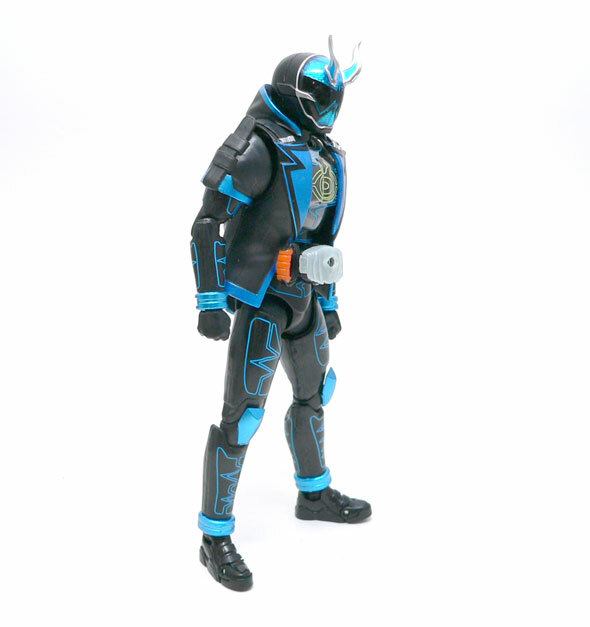 Speaking of his belt, a Kamen Rider typically henshins with the use of a driver device. Normally, a belt mounted contraption. Ghost and Specter are no different. (Necrom from the Ghost series is, but I didn’t order him.) It took a while for this driver to grow on me. It has an eyelid shaped opening in the cover plate so you can see what eyecon is inserted. The figure replicates this. 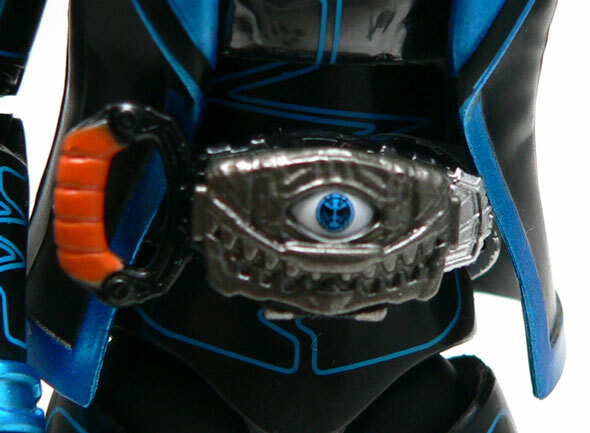 While you can’t open the driver up wide enough to get an eyecon in, the front plate does pop off revealing the scary mechanical face thing underneath. Honestly, that thing creeps me out. I was a bit disappointed you couldn’t move the handle in and out on the driver. I am impressed with the flawless tampo to produce his eyecon symbol in the middle. 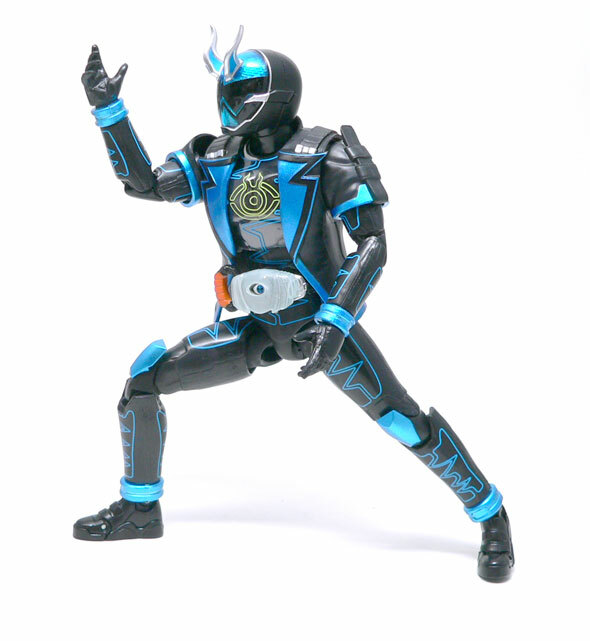 Speaking of eyecons, SH Figuarts first releases normally come with a special bonus accessory. 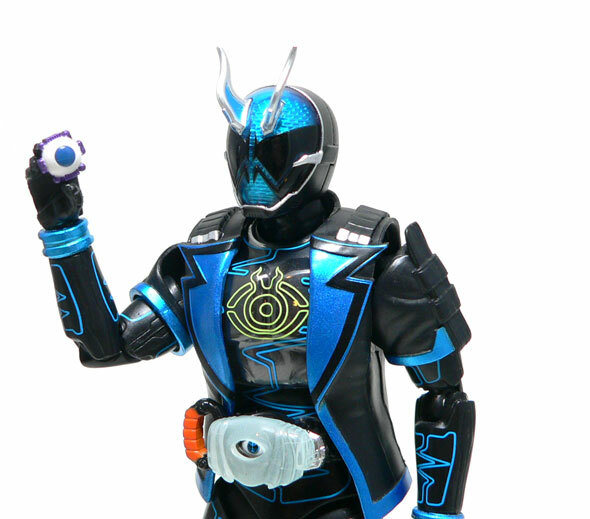 For Specter they included some of the show’s Eyecon’s. Four are standard ones for the show used by the characters to gain the powers of the “Legendary Heroes.” Light blue is Tutankhamen. Purple is Nobunga, Yellow is Edison. The dark blue one is either his normal Specter one to change him to Specter or Houdini. I can’t tell quite from the colors. Unlike the one in the driver, the faces of these are blank. There is one Eyecon that is different. It is pink and grey and has a bit of a tail. Could this one be the soul of somebody special to Specter? BTW, these things are very tiny. They are part of the reason you can tell this is collector line not focused on younglings. I’ve kind of became addicted to these figures. Ghost and Specter are the first pre-orders I’ve made for a currently airing show. I have to say at the time I pre-ordered Specter, I was only lukewarm on him in terms of the show. I did really like the design. I’m glad I did order him now. He’s evolved on the show. I’m regretting not pre-ordering Necrom now. Specter though is pretty good in execution. You can tell time and planning goes into creating these figures and accessories. When you have one of these on your desk in front of you, it is truly like having a miniature version of the character in front of you.